Lincoln historian, and scholar Guy Fraker will be the featured speaker in the popular Hosmer-Williams Lecture Series at Farley’s Music Hall, Elsah, Illinois, Thursday, March 19, 2015 at 7:30 pm. The lecture is sponsored by Historic Elsah Foundation. The Series is underwritten by Liberty Bank of Godfrey, Illinois. 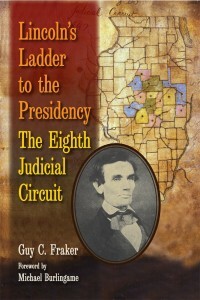 A retired attorney from Bloomington, Illinois, Fraker is the author of Lincoln’s Ladder to the Presidency: The Eighth Judicial Circuit. As a central Illinois lawyer himself, Fraker knows well the 8th Judicial Circuit. In Lincoln’s Ladder he describes the personal side of Lincoln, his relationships with his colleagues, clients, and the communities of the Circuit. He looks at the participants in Lincoln‘s cases and analyzes Lincoln’s considerable networking ability as he built his law practice and political base. This is the story of how Lincoln was catapulted to the Republican nomination for President in 1860. Fraker is Chairman of the Looking for Lincoln Heritage Coalition, the action arm of the Abraham Lincoln National Heritage Area, a 42-county area in downstate Illinois established by act of Congress on May 8, 2008. He was the consultant on the award- winning PBS documentary, “Lincoln, Prelude to the Presidency,” and co-curated “Prologue to the Presidency: Abraham Lincoln on the Illinois Eighth Judicial Circuit,” a traveling exhibit that is also on permanent display at the David Davis Mansion, a state historic site in Bloomington. He served as an adviser to the National Lincoln Bicentennial Commission. Fraker is a graduate of the University of Illinois College of Law and a past president of the McLean County Bar Association. The lecture is free and open to the public. The book Lincoln’s Ladder will be available for purchase and to be autographed by the author. Refreshments will be served following the lecture. Reservations are not required. Parking is available.